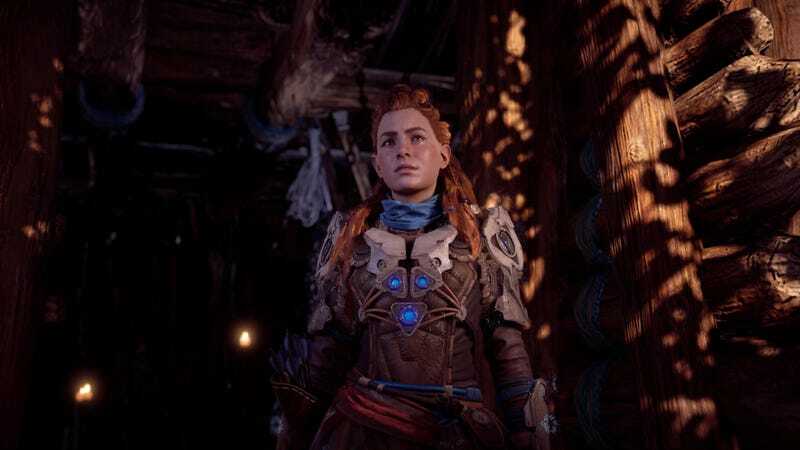 Thanks to New Game +, here’s Aloy in Horizon’s best armor before she’s even cleared a bandit camp or climbed a Tallneck. A new patch for Horizon Zero Dawn adds an Ultra Hard difficulty mode and New Game+, in case you feel like playing through Aloy’s adventures yet again before the expansion hits. Horizon, which came out for PS4 in February, remains one of the best games of 2017. Instead, you’ll need to load up a completed save file. As anyone who finished Horizon knows, after you’ve beaten the final boss and the credits roll, you’re sent to the moment right before the game’s final quest begins. When you load up that save, you’ll get an option to create a New Game+ loadout. This allowed Kotaku’s Stephen Totilo to take a 59-hour, level 48 playthrough into the new mode. The game doesn’t indicate that you’ll encounter many differences in the new playthrough, though it does add some facepaint options and new gear, contingent on finishing the more difficult modes (our tested playthrough was on normal, so we didn’t see the new facepaint stuff). Thankfully, Horizon’s developers spare people who start a New Game+ from replaying the game’s introductory levels. Sure, it’s cute to play the kid version of Aloy, but there isn’t much need. You skip the “A Gift From The Past” and “Lessons of the Wild” quests and begin with “The Point Of The Spear,” a quest that begins with you needing to find Rost. You’ll still need to do The Proving and some other stuff before the game fully opens up. Horizon always keeps five auto-save files and a handful of quicksaves, but it’s a safe bet that playing into New Game + will eventually overwrite any of those saves tied to an end-game file. If you want to keep a copy of Aloy right at the brink of completing the game, it’s probably best to do a manual save there.